Experience traditional Japanese instruments such as Shamisen and play some Ozashiki games in Minamimori-machi, Osaka. We are instructors and students learning Japanese instruments and wishing to share Japanese culture with people from all over the world. You will not only experience watching an instrumental performance, but also you can have fun playing Ozashiki games. Ozashiki is a special party stunt played in ancient entertainment areas such as Gion. but we shall offer you the opportunity of witnessing a live performance with a reasonable fee. For guests to enjoy the wonderful live performance, we are making sincere efforts day-to-day. 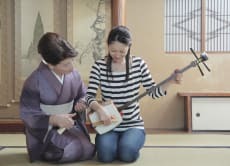 Experience playing the Shamisen and play Ozashiki Games!